Perhaps itâ€™s the attitude of people; relaxed, fun-loving and carefree. It could also be the weather; warm sun, long days, blooming flora, etc. More than likely itâ€™s a combination of both. Whatever the cause, something about summer really gets me in the mood for fruity candy. Soft, hard, sticky, ooey, gooey, gummi â€“ fruit flavored sweets tend to be a personal favorite during the long warm days. This summer, Iâ€™ve been particularly interested in gummi fruit candy. Living in Munich, Germany fruit is always on my mind as I walk by the open-air fruit stands scattered abundantly throughout the city. Of course, I pass on the natural fruit â€“ equally great in flavor and nutrition â€“ and I head straight (bee line, really) for sugarâ€¦ processed. One candy Iâ€™ve become quite fond of is Storckâ€™s Nimm2 Lach Gummi, a fruit flavored gummi treat with various gummi flavors to choose from â€“ all nice for a warm summer sugar rush. Available for consumption are Joghurt (Yogurt), Frucht & Joghurt (Fruit & Yogurt), Frucht (Fruit), and Sauer (Sour). 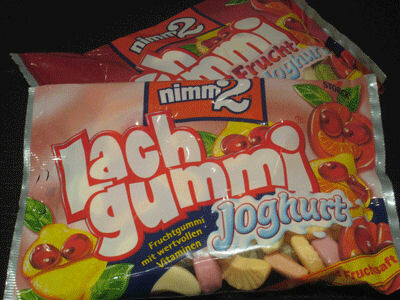 Nimm2 Lach Gummi is a well known candy producer headquartered in Berlin. A product of August Storck KG, Nimm2 has been producing fruit flavored candy since 1962.